(Updated) College of Arts and Sciences Student Council (CASSC) officers of the University of the East (UE) in Manila have been threatened to be blocked from graduation should they not sign the tuition and other school fees increases documents, according to a text message from a Students Affairs Office employee. CASSC Vice President Martin Nepomuceno reported to have received threats due to his refusal to sign the documents pertaining to the proposed 5% tuition increase in the university on Monday, March 18. The documents included the minutes of the consultation as well as the approval of the proposal. In an interview, Nepomuceno claimed that his signature has been sought after by the school administration despite his disagreement with the proposed tuition increase of the school. 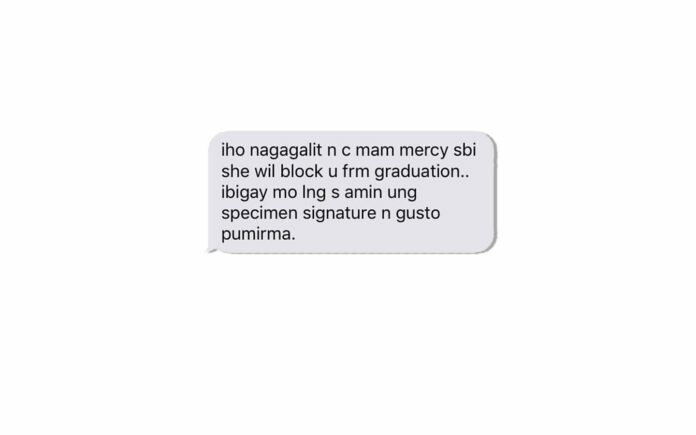 He claimed that the administration staff even went as far as threatening to block his graduation should he not sign the documents. “I personally expected that this would happen so I was not that surprised. The administration would really do its best to forward its own interests. On our end, we are doing our best to strengthen our campaign to stop the looming tuition and other fee increase,” said Nepomuceno in Filipino. Currently, youth organizations and the student body within the university have been part of the continuing signature campaign against the tuition fee increase. The initiative, launched by the Kapit-Bisig Party Alliance, has already gathered hundreds of signatures. The students also planned to reach even the networks of the parents for the campaign. The students aimed to continue raise awareness and build unities against the impending increase. The Kapit-Bisig Party Alliance won the majority of seats in the University Student Council early this month with their stand against the tuition increase as one of their main campaign issues. “As student leaders, our mandate does not lie on the administration but on the students. It is clear that students are against the tuition and other school fee increases, that’s why we are forwarding this call. We also condemn the administration’s moves to disregard the students’ voice. We are calling all the students to unite with our campaign against tuition and other school fee increases. Only in our collective action can we champion this struggle.” Nepomuceno said. News about the incident earned the ire of various youth groups. “This is a clear blatant act of intimidation of student council leaders who genuinely stand against the tuition increase. Nevertheless, this is not an isolated case where student leaders are being intimidated by the administration thus using their power to repress students who are standing and advancing the rights of the students,” said National Union of Students of the Philippines Metro Manila in their statement. Meanwhile, Kabataan Party-list Metro Manila expressed its concern over the administration’s recent steps to “pressure” student council heads into signing documents important to the fruition of the school’s tuition and other school fees increase. In their statement, the youth group manifested the consequences of such actions especially with the developments of the continuing campaign waged by the student body. “Adding their signatures would mean their agreement to increasing tuition and other school fees to as high as 5% for A.Y. 2019-2020. Pressuring student council heads into signing the TOFI papers shows the administration’s disregard for the students’ voice in implementing school policies, especially those directly affecting students and parents/guardians. Members of the student body have initially expressed their disapproval versus the TOFI amid lack of a public consultation,” said Kabataan Party-list Metro Manila in a statement. Kabataan Party-list Metro Manila also extended its solidarity with the students campaign against the continuing increase.